Almost a million US citizens visit Turkey each year. Also, a half million Turkish people live in USA. The bilateral relationship between the two countries goes back several decades. simplecall gives you the chance to call Turkey at a very cheap rate. Our rate starts from 3.55¢ /min to landlines and mobiles. And the best part is that, with simplecall, we only charge what we advertise – no hidden fees like many other calling card companies. simplecall has a single minded approach to its customers – the only thing that matters is customer satisfaction. With our cheap prices, we still are able to provide a high quality international calling service. We made our service PINless so that you don't have to go through the hassle of entering a PIN number every time you want to make an international call. The best part is that you don't even have to leave your house to purchase a simplecall account. 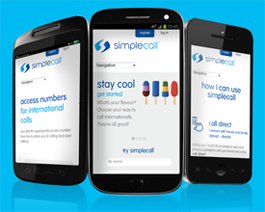 We are an online calling card and therefore you can easily open an account with us by visiting www.simplecall.com and registering – it’s quick, simple and convenient. In the last decade, Turkey has achieved a lot in both its economic and social sector. It has always been considered the gateway to the West, sitting at the cross road of the Asian and Western world. Turkey also recently connected Europe with Asia by building a $3 billion train tunnel that runs 60 meters under water called the Marmaray.